Instead of recognized red-white paintwork a blue-white mood for the new Spartak stadium was announced by Kommersant today. Except that blue-white is the colour scheme of Dynamo, Spartak’s bitter rivals. No wonder club owner himself decided to take a stand. Today’s edition of Kommersant rvealed that Spartak reached an understanding with Otkritie financial firm. 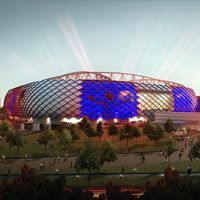 As part of the deal Otkritie would acquire naming rights for the new 42,000-seater in Tushino and Kommersant suggested branding would include stadium colours to shift from red-white to blue-white of the company. However, for supporters blue-white colours are those of Dynamo Moskva, not Otkritie. No wonder a small scandal broke out, pushing Spartak owner himself to take a stand. “The colors won't change. It's complete nonsense. The stadium is red and white and will stay that way. We absolutely want our partnerships and cooperation to be as comfortable as possible for Spartak's fans” said billionaire Leonid Fedun.